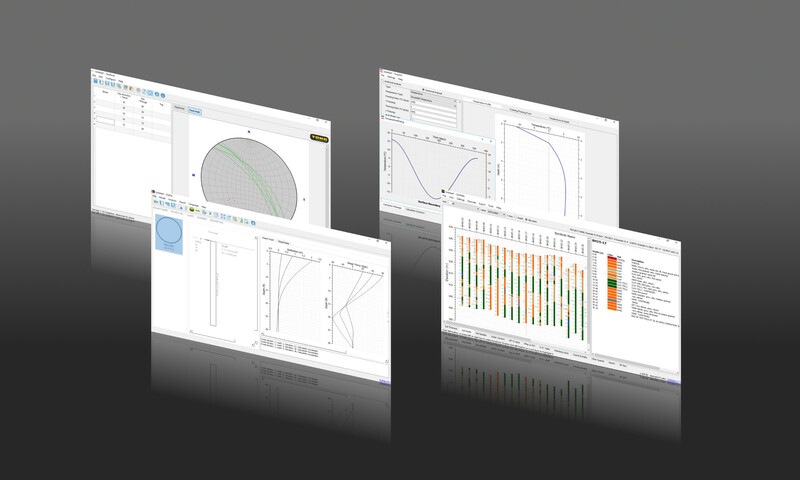 PyPile – Yong Technology Inc.
PyPile is a lateral pile analysis software program based on p-y curves. Pile deflection, bending moment and shear force will be analyzed with different load cases. PyPile comes with common pile cross sections and custom cross section. Typical soft clay, stiff clay, sand p-y curves (Barry J. Heyer and Lymon C. Reese) and custom p-y curve are included. Free or fixed pile-head boundary conditions are available to users. If I wanted to export the p-y curves used at every lateral spring of the model, how should I go about that? I read in a master thesis that someone did that, but I can’t figure how. And thanks for the great work! Daniel, you can export the p-y curves from Menu Analysis – p-y Curves. Hi yong, today when I opened Pypile, have a window info popup that the license has expired since feb. 1, 2019, and Pypile does not open. I have last version 0.6.2. Hi Dani, please download PyPile 0.6.3. Hello Yong, first of all, I would like to thank you for providing this software for free. I have been trying it out and realized that I cannot enter decimal places (specifically the dot sign “.”) in the input boxes. I read from the comments that someone had a similar problem that was solved. In my case I’m using Windows 10 and I’ve installed Visual C ++ Redistributable for Visual Studio 2015. Any help would be appreciated. Can you input the dot sign somewhere or not at all? If you default input language is not English, your can change your input language to English and try. Please let me know if it works. Hello, Yong. I’d like to know what articles or textbooks I should read to understand better how this software does the calculation. I am using it for a college project. Hi Luan, please read Analysis of Single Piles under Lateral Loading by Heyer and Reese. You can find the link on the top of this page. How do I buy a licenced version? You can download and use it for free. First of all, thank you so much for such a great software!! I have been using it for a while and since day 1 I have noticed that the depth intervals in the legend of the P-Y curves is never and integer number, for instance instead of 1m, 2m, 3m, 4m … the legend shows 0m, 0.945m, 2.025m, 2.97m, 4.05m… Is there any way to fix this? Hi Alonso, Can you send me a example file so that I can figure out why and how to solve the problem? Yong, thank you for your response. I have just sent you an email with a file. The reason you have the decimal points is that the 13.5 m pile is divided into 100 segment for calculation and the depths of the p-y curves shown on the graph are the closest points to the 1 m interval you specified. Thanks Borax. Will correct it in next release. Hi Yong, in the Analysis>p-y Curves dialog, the depth is measured from the top of the pile instead of from ground level. Everywhere else seems to use the ground level as zero-depth. Also, there’s a minor spelling error in the Export menu: Export Reult Graph instead of Result . Thanks Stephen, will correct them shortly. How is the k value calculated for analysis? The geotech report provided modulus of subgrade reaction as 10000/B kN/m^3, where B is the pile dia. If pile dia is 500, k value would be 10000/0.5 =20000kn?m^3? Based on the definition of k for stiff clay model and sand model, k should be a characteristic parameter of the soil and independent of the pile width B. Or you can take a look the elastic model in which k should be the definition of E/b. I’ve just started using PYpile today. It looks very good and easy to use. Is it possible to get graphs (and tables including Excel export) for the force the soil applies to the pile? I can only see the ‘structural’ results of deflection, shear force and bending moment, which were displayed by default. Stephen, you can get the graphs and data tables from the export menu. but can’t display it directly in the software. 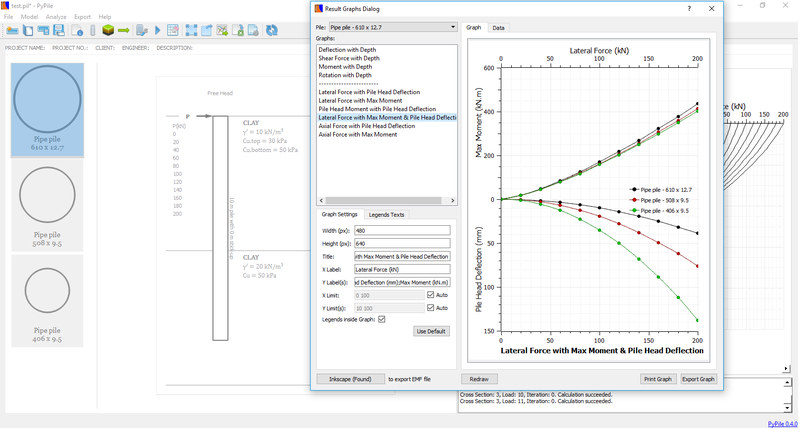 The software just displays the results for the pile structural design as far as I can tell. Stephen, I emailed you a soil resistance graph. Please let me know if this is what you are looking for. I’ve downloaded the mac software for pypile, but when i try to run it, pypile “quits unexpectedly”. I have dowloaded visual C++ but the same thing happens. If there anyway to get it working? Can you let me know which version of your operation system is? What is the information message by clicking the report button? Ye, thank you for a fantastic piece of software. You’ve done a fantastic job to put it together. I use it to sanity-check column designs for subsea manifolds and also jetties, and for some preliminary designs. Thanks for using PyPile, Brian. Thanks for the software! It is sensational!! It seems you use Reese model for saturated sandy layers and Matlock model for saturated soft clayey layers . I believe the former is described in the paper “ANALYSIS OF SINGLE PILES UNDER LATERAL LOADING” by Reese (1979) available for downloading from your website. However I cannot find the latter. What is the title of the paper by Matlock? Thanks Alonso, saturated soft clay model (by Matlock) is outlined in page 20 in the same paper. apparently my pile was at the same depth as the soil, that was the problem. Thanks Dvir. I will fix this bug. Hi Dvir, Can you please send me a screen copy of the error and also send me the file you were working with? What version of your operation system? does the software free for commercial purpose? Yes, it is free for commercial use. Hi, there is an error when I tried to run the program, it says “This application failed to restart because it could not find or load the Qt platform plugin “windows” in””. I am using Windows 10. Thanks and more powers! Do you have platforms/qwindows.dll in your PyPile folder? Hello Yong, it is now working perfectly. Thanks! Nice program! The program can’t start because api-ms-win-core-rtlsupport-l1-2-0.dll is missing from you computer. Try reinstalling the program to fix this problem. If you use Windows 7, 8 or 8.1, please refer to the tips below the download link. I recently tried PyPile and I found it’s use to be very straight forward and efficient. This is a very nice analysis program for piles. One thing is that on the list of soil models the names just appear as plain text and not until you double click on the name do you see that’s is a drop down list box to select the different soil models. If the drop down arrow would appear all the time, I think this would help people realize this is a list box to be selected from and not just displaying text. Is there any plan to add nonlinear behavior of reinforced concrete sections? Thanks Greg. You are right, only plain text of model name shows in default. I will try to implement your thought in the next release. The nonlinear reinforced concrete sections will probably be implemented in 0.7. Hi Yong, I have Windows 10 and cannot start pypile. I have tried installing C++ 2015 redistribute, Windows 10 SDK and removing the .dll files you have mentioned above. Do you have any other ideas on how to get it working on W10? Rohan, what error message did you get? Make sure VC++ Redistributable 2015 is 32 bit. Windows 10 SDK is pre-installed in Windows 10. Hi Yong, Sorry for the late reply. I have recently reinstalled VC++ 2015 x86 to no success. 1. Keep your operation system updated. 2. Download and install Microsoft Visual C++ 2015 redistributable package (x86) (ignore this step if you have VC++2015 installed). 3. Delete msvcp140.dll and vcruntime140.dll from PyPile folder. I have tried the three steps you have mentioned without much luck. I tried installing on another W10 computer and it works perfectly, so it looks like mine is the issue. I’m not sure where to start to get it working. I have Visual Studio 2010 installed, could that be interfering? Not so sure what the problem is. Possibly the program was linking to Visual Studio 2010 dlls somehow. If you have VS 2015 installed, you can try uninstall VS 2010 and see what happens. Thanks Sophie. You can add minus values for pile head loads. For example, you can enter -100 kN.m for moment. I cannot type minus sign at the moment section. Here is what I am doing: double click the load part – free head – at the load generator try to input “-100”, but I cannot type “-” in the box. You should be able to directly input the negative loads in the load table on the left side of the dialog. I will fix the loads generator part. The loads generator just helps you create a list of loads. The groundwater level has been removed from v0.3. Now users should enter the effective unit weight of soils. This is what I see on my computer. I fixed this error and updated the fixed version online. PyPile 0.4.0 with English units and result graph export will be available in a few days. Can you show me the information after clicking the report button? I have a Mac OS Sierra installed on my mac. The program does not work. I get the following message when I try to run the program.Please advice. Check with the developer to make sure PyPile works with this version of macOS. You may need to reinstall the application. Be sure to install any available updates for the application and macOS. AP, the current PyPile Mac verion is compiled on El Captain. PyPile 0.4.0 compiled on Sierra will be released in a few days. Let’s see if this problem can be solved with PyPile 0.4.0. Hi Yong, great Software! Congratulations. Thanks, AniAmos. Actually, it is in my to-do list. Can your program switch to English units? Currently only metric units are provided. are you ever going to provide the program with english units? Yes, I will make English units available in one of the upcoming versions. How soon do you think you can make this happen? E.g. section HP 360×174 on strongest axis (which in PyPile is X-X) has I=508e+6 mm2 and it’s respective width is 378 mm, not 361 mm. 1. Users should be able to enter decimal point. Which version of windows do you use? Make sure you enter a ASCII dot, not a Unicode dot. 2. It is fixed in version 0.3.1. Thanks. I am able to put a decimal point only in the load definition window and for soil layer thickness. When i am pressing dot symbol on my keyboard in any other window it is not showing up. I am using Win 7 Ultimate x64 with Latvian regional settings. I am not sure whether i understand the difference between the ASCII dot and Unicode dot. I tried to copy the dot symbol from http://www.theasciicode.com.ar, but it didn’t work out. The new compilation 0.31 is not opening because of few missing dll’s which i believe is because that i have no Windows 10 SDK installed. The reinstall of Visual C++ Redistributable is not helping as it did previously. For the future versions, can you make the custom pilelibrary xlsx file not to disappear after updating the software? 1. Can you try installing Windows 10 SDK and then test the decimal point problem? Please let me know the results. I will try my best to find a Windows 7 to test it. 2. Currently the best way is to save a copy of your modified pilelibrary excel file and then overwrite the file in the new release. I will check if there is a better way to do it from my side. I installed the Windows 10 SDK, but it didn’t work out. I tried to install Windows 7 SDK as well, but i still had the same errors. I tried to place the missing files (api-ms-win-core-memory-l1-1-2.dll, api-ms-win-core-rtlsupport-l1-2-0.dll) in PyPile folder, but still nothing. Please delete msvcp140.dll, vcruntime140.dll, and vccorlib140.dll from the PyPile folder. It should work now with Visual C++ Redistributable for Visual Studio 2015 (32 bit) on systems earlier than Windows 10. Deleting of those files and installing 32 bit VC++ Redistributable made it work! Thanks! Please install Windows 10 Software Development Kit (SDK) or Visual C++ Redistributable for Visual Studio 2015. Thanks! Now it’s working! By the way – nice software! Will there be in the upcoming versions automated reporting or at least a function to export result graph not just the values? Graph exporting is in my to-do list. I am trying to find a way to make the exporting flexible, because different companies normally have their own formats for reporting. Any suggestions please let me know. Thanks. Please send your file to me and let me check it out. Piles with eccentricity is not possible in this, can u help me with that? Based on your email, I understood that your lateral load location was above ground surface. What you need to do is to enter a positive value for the pile stick-up in the pile setting dialog. I am wondering if the parameter for sands should be units of kN/m^3 instead of MN/m^3. I seem to be getting results wildly different to comparisons calcs using different methods. It is kN/m^3. It is corrected in version 0.1.2. Thanks for letting me know.